If you haven’t already noticed, black women are currently slaying the travel scene. In fact, we are traveling now more than ever before. African-Americans’ intent to travel reportedly increased by 19 percent just from 2015 to 2016. According to the Mandala Research Firm, 17% of us take one or more international trips a year, and we spend $48 billion on travel in the United States alone. But in a society where the typical jet-setter is portrayed as white, minority travelers are consistently underrepresented by the mainstream travel industry. Despite the media’s misrepresentation, there is a large, fast-growing community of black travelers, and these six trailblazing black travel groups are at the forefront. All owned and operated by BAUCE women, they share a common goal: to shatter the stereotype that people of color don’t travel. Nomadness is a pioneer of the black travel movement. It started as a web series back in 2011, when founder Evie Robbie began documenting her travels via YouTube after a year and a half of globetrotting. Since then, her project has evolved into a multi-platform community of more than 15,000 members with over 100,000 passport stamps. In addition to the NomadnessTV web series, they host a yearly travel conference, workshops and events, and group trips through the Nomadness Travel Tribe. With a demographic that’s 80% female and 85% African-American, the Tribe unites like-minded individuals looking for an alternative to mainstream travel. Those wishing to join must have at least one passport stamp and complete a Newbie Bootcamp. The average sellout time for their trips is five minutes! Travel Noire is a stylish, sophisticated black travel group geared towards young professionals. Founder and CEO Zim Ugochukwu created the community as a space for people of color to share and bond over experiences abroad. Three years later, the Forbes 30 Under 30 entrepreneur sold her thriving business to Blavity, Inc to help scale the ability for unconventional travelers to learn and grow. Travel Noire’s message is simple: you can and should make travel a priority—and you don’t need a ton of money or vacation days to do so. And the best part? They’re here to show you how. Aside from offering exclusive group trips dubbed “Travel Noire Experiences,” the company recently launched Compass, a community course designed to equip members with the knowledge and tools needed to travel the world on their own terms. It features guides like “How to Convince Your Boss to Work From Anywhere” and “Hidden Destinations You Won’t Believe Exist”, along with live Q&A calls and trainings with world-class experts. If that doesn’t draw you in, one look at their Instagram account will leave you overcome with wanderlust. Be prepared to spend hours scrolling through their colorful collection of real black travelers in the world’s most stunning destinations. Tastemakers Africa’s motto is “travel Africa, skip mediocre.” While images of travel in Africa are often limited to safaris and camel rides, this company designs itineraries that focus on interacting with the local people and culture through art, music, and cuisine. This black travel group hosts tours of cities like Lagos, Dakar, and Accra. The group also hosts authentic activities curated and led by locals. Cherae Robinson started the company to change the often-negative perceptions of the continent. Her former NGO job frequently led her to African countries, but her journeys were often met with fear and skepticism from those at home. But upon seeing people’s positive interest in response to the photos and stories she brought back with her, she saw an opportunity to transform the narrative by inviting people to experience some of the lesser known aspects of African life. Soon after, the Tastemakers brand was born, and it has since grown into a global community with offices around the world. If you’re planning your own trip, be sure to check out their mobile app, TSTMKRS, to find the best events at your destination, ranging from hidden beach escapes to pop-up dining with local chefs! Black Adventuristas founder Veronica Garnett credits adventure with saving her life and is on a mission to inspire more women of color to live daringly. The Howard and Columbia graduate’s first big adventure was completing a flying trapeze class back in 2010, in the hopes that conquering her fears would help her better manage the severe anxiety and depression she struggled with daily. Since taking that leap, she hasn’t looked back; she’s checked skydiving, rock climbing, volcano trekking, and other exhilarating feats from her list. Inspired by her own life-changing experience, Garnett launched Black Adventuristas as a platform to encourage, celebrate, and connect adventurous black women. According to their Facebook page, the group “aims to inspire black women to conquer their fears, pursue their dreams, and fully experience the adventure that is life. Whether it is traveling the world, tackling an epic bucket list, quitting a “good” job to pursue a non-traditional career, trying a daring new hair or lipstick color, or simply dining alone for the first time, all adventures are worthwhile.” Check out their Instagram, Facebook, and Tumblr, and keep an eye out for their upcoming website. With that empowering message—along with their group tours of incredible destinations like Cuba and Barbados—Black Girls Travel Too is emboldening more and more women of color to discover the world on their own terms. Are you into traveling in crews? Then this is the group that you need to know about. Started by two travel addicts, Shantoya and Willie, outside of a cafe in Greece, Passport Posse was born from the need to reverse the negative perceptions and encounters that they had experienced as African-Americans in foreign countries. The goal of Passport Posse, according to their website, is to 1) encourage the travel frequency of minorities abroad, 2) provide a platform for healthy travel interactions and communities of practice, and 3) create trips and sponsor activities aimed to immerse globetrotters in the culture of the countries they have elected to visit. One thing that makes Passport Posse unique is the fact that they really help you to reduce your overhead costs when lodging abroad if you sign up to become a member. Not to mention, this crew is filled with serious travel enthusiasts — the lead ambassadors have both collected at least 25 stamps (and counting) in their passports! Last but not least, this travel group is a secret gem that will help you discover the world. Founded in 2011, Urban Events Global members are predominately people of color who enjoy experiencing all that life has to offer, from exotic trips to international travel. The group currently has more than 50,000 members and includes accomodations for their international packages. Every year the group hosts an adult camping trip in Central Texas for individuals who love the outdoors and are looking to bond and make new friends in the company of Mother Nature. For people that love the seas, Urban Events Group also offers a luxurious cruise weekend every March for ultimate party-goers. If using your passport is more your travel style, then you can also partake in an annual international meetup that occurs in far-off, activity-packed locations. If you’re looking to mingle with a mature and fun-loving crowd, then Urban Events Global is your crew. Check out The Pack Roadtrip Travel club founded and operated by Andrae Marable based in Portsmouth, VA!! I have been on numerous trips with “The Pack” and each experience has been memorable. Andrae’s professionalism enhances the variety of events offered and the price packages are easy on the pockets. 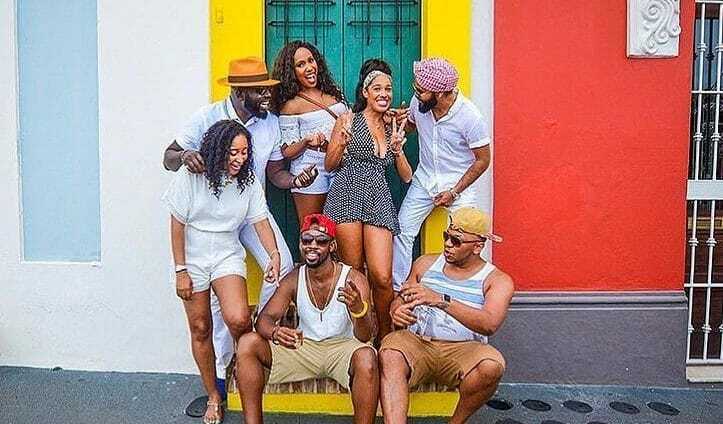 The Pack is one of best black travel groups on the rise! The Pack Roadtrip travel club is a great black owned business in Virginia. I have done short weekend tris and extended stay trips. Andrea Matabele is the greatest. Check out Jet Black! @globaljetblack on Instagram. You should check out Travel By Design also. It’s based in Philly and they do some awesome trips!!! Are all of these groups predominately female? Very inspiring . I love it!!! Yep! It’s a phenomenon I’ve noted for a while now and also why I intentionally try and curate trips which include men. Check out BlackGirlFly.com all black women! How do i join the travel group,? I seek culture travel club!! Black Travel Movement has nearly 175,300 members in their Facebook group. LS Travel Club is another, both male and female. I’m a 57 y/o married female that wants to travel. My husband isn’t interested so I’ll go it without him. But I’m not interested in the beach/bikini loving groups. What’s the best travel group for me? Pingback: Why Solo Travel Is so Worth It - and Reasons Why You Should Try It! Wow, you missed the most dedicated black girl travel group Black Girl Travel Movement (BGTM) is an international membership based organization that facilitates transformational experiences “BGTM does not host trips”all around the world to improve the lives of black women and their families. Through their unique one of a kind travel experiences, BGTM offerS a sacred space for its members that encourages black women to make self-care their top priority, assist black women with identifying personal goals, fellowship with likeminded women while celebrating their individual life achievements through travel. I booked with Black Girls Travel Too, and their customer service was horrible. After they canceled the trip due to poor attendance, we only received a credit for a future trip. I would never book with them again.